With the Cryo CHILL Facial™ you will get an immediate response with ten minutes of gently cooled air to help stimulate collagen production in the deeper levels of the skin. This is performed by disrupting the natural production of collagen in the deeper layers of skin, and the body responds by creating more collagen. 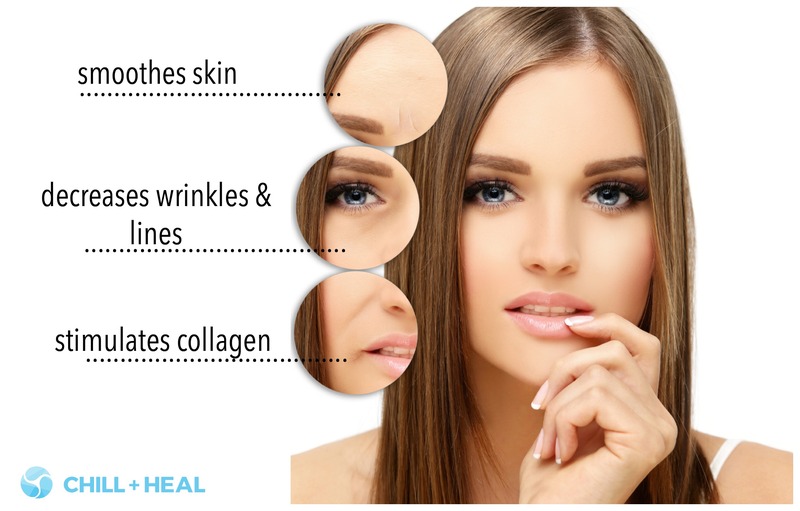 The increased collagen production allows the skin to regain elasticity, appear smoother, and bring forth a youthful glow to your face.Pores will appear smaller and facial “puffiness” will be decreased. With the Cryo Beauty CHILL Facial™ you will receive fifteen minutes of gently cooled air to help stimulate collagen production in the deeper levels of the skin. Helping to increase the skin’s capacity to rejuvenate itself, regain elasticity, appear smoother and bring forth a youthful glow. Pores will appear smaller and facial “puffiness” will be decreased. Focusing on your face, neck, décolletage, and hands.